Renault’s promising entry level hatchback is soon to be launched and booking for the car has already started with booking amount being Rs. 25,000. Most of the dealers have confirmed the delivery of the car by the end of September 2015. Renault unveiled the Kwid hatch in May 2015 by the company’s top brass Mr. Carlos Ghosn. Mr. Ghosn known for this ability to turn around the profits of the company positively is very ambitious about this small car. Kwid concept was showed last year and it was impossible to expect a small car with the profile the concept car had. Renault has developed a 3 cylinder 800cc petrol engine to Kwid. Kwid is built on versatile common modular platform which will be shared with Renault’s sister concerned companies Nissan and Datsun. After working hard for over 6 months Renault engineers from India as well as France could design a small car will the looks of an SUV. It is reported that the engineers from both the countries shared their views, Indians with frugal engineering thought and French with the quality and style. 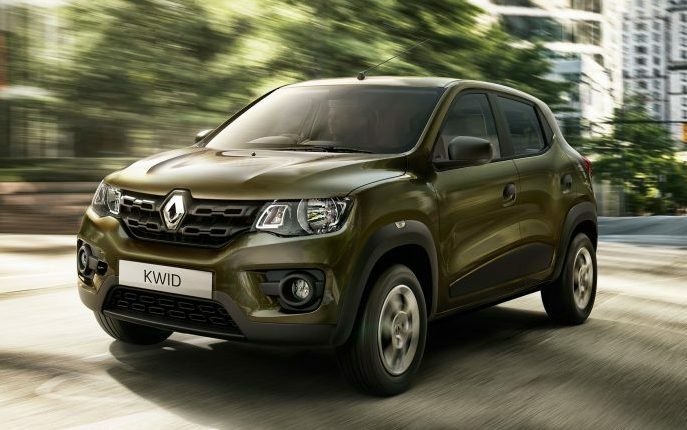 Renault Kwid, as mentioned by Mr. Ghosn will be priced between Rs. 3-4 lakh. It will be the base model with black coloured front and rear bumpers and non internal adjustable outside rear view mirrors. Also the base model will lack the power windows option but what’s interesting is the entire model range will get a touchscreen dashboard display which is the first in its class. Being roomier than its competitors, namely Maruti Alto and Hyundai Eon, Kwid stands ahead of the competition yet being priced equal to them. A car of Kwid’s stature will definitely need a diesel option. But according to Mr. Ghosn Renault has no plans to launch a diesel engine powered Kwid in the near future. A bigger 1.0L petrol engine might find its place after a while. But rumours are there that Renault is working on a 2 cylinder K9K engine along with Bosch, which means Kwid’s diesel dream could be a possible some time later.